OpenWorks, one of America’s leading integrated facility services franchises, recently revealed the company’s new brand strategy featuring the new and improved “Improving Facilities and Pleasing People” tagline. OpenWorks developed the new brand identity with 919 Marketing, the company’s marketing agency of record. The two companies worked together on a full scale brand repositioning program that included feedback from franchise owners, sales team members and customers. The updated tagline focuses on the organization’s two core value propositions as agreed upon by all three of those key audiences. Created more than 30 years ago, OpenWorks is one the nation’s leading integrated facility services franchise systems with 330 franchise locations in five states. Since its inception in 1983, the company has operated with a “There is a difference” philosophy - promoting their company’s commitment to customer service. However, as founder and CEO Eric Roudi suggests, it was time to show customers and prospects exactly what the OpenWorks difference means for customers and franchise sales prospects. According to Roudi, this new tagline fits perfectly as all OpenWorks franchisees follow green cleaning techniques that enable them to improve the health and cleanliness of the facilities they serve. Further, each OpenWorks franchisee is passionate about creating and maintaining close relationships with clients, serving as the sole account manager even when preferred partners provide complimentary services. 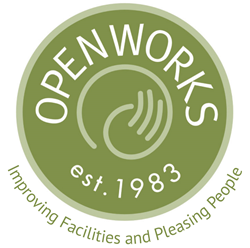 The corporate office and all franchise locations will use the new OpenWorks tagline of “Improving Facilities and Pleasing People”, which has been incorporated into the company’s logo. It will also be used on the organization’s website, social media accounts, marketing material and business documents. For more information on OpenWorks, please visit http://www.openworksweb.com. Established in Phoenix, AZ in 1983, OpenWorks is a leading national commercial cleaning franchise that offers integrated facility services through highly reputable local affiliates. In 30+ years, the company has grown to 330 franchise locations in five states from Illinois to California. OpenWorks is guided by a simple philosophy: a cleaner, safer and healthier environment means a more productive workplace. The OpenWorks franchisees and preferred partners who serve more than 1100 facilities each day offer more than simple cleaning and maintenance - they help their clients fundamentally improve their work environment. Each OpenWorks representative implements an environmentally friendly “Green Clean” program using the highest quality equipment. The OpenWorks difference is all about open, flexible relationships. Each OpenWorks customer receives customized solutions that fit the needs of their specific facility.